Thank you for the many requests for a video-taped Dutchman “clinic” that follows John through the process of fabricating and executing Dutchman topside repairs. As several earlier ’46 Brightside U22 videos have illuminated, John begins by inspecting every square inch of the topsides, marking any spot or area requiring cosmetic attention/repairs with blue painter’s tape. The Dutchman begins with cutting the channel or slot in a plank using a plunge router, or what is the female component of the Dutchman. A key to achieving an invisible Dutchman is that the slot run with the grain to the maximum extent possible. After cleaning and carefully defining the slot’s edges and shape using hand chisels and selecting a piece of old mahogany having color and grain properties similar to the plank being repaired, John fabricates the plug, sanding on it until it fits perfectly. It is subsequently glued in place using Jamestown Distributors’ TotalBoat Thixo Wood 2.0 to which a bit of the stain we will use on the hull has been added. As we detailed in the last video, stirring stick “stitches” that will hole the plug in place, are secured by wood screws passing into countersinks from which those securing the plank have been removed. Twenty-four or so hours later, the Thixo Wood 2.0 has cured, the “stitches” are removed and John fairs the plug to the plank with a wood chisel. 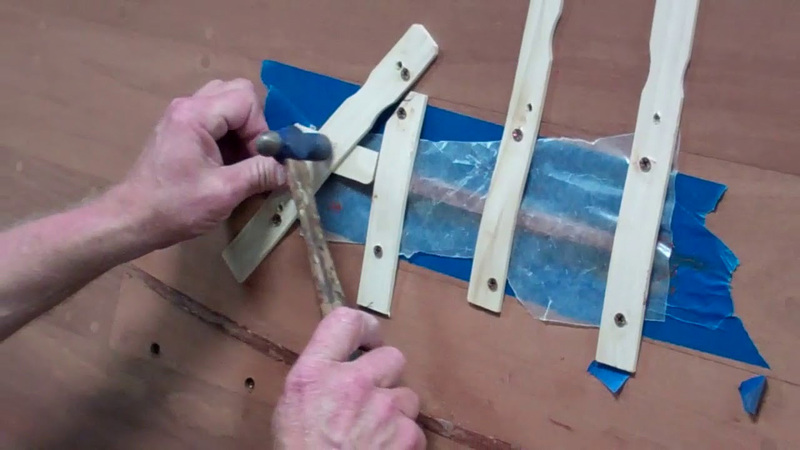 He leaves the blue painter’s tape in place as a depth guide for his chisel. Finally the tape is removed, screws are driven home into the countersinks, bungs are inserted and glued in place using Thixo Wood 2.0, and the area is ready for sanding. We hope to have the topsides and transom sanded, and the hull flipped upright sometime next week. Next PostNext 1946 Chris Craft U22 – Bleaching Time!